Urea is the end product of the protein metabolism. It is synthesized in the liver from the ammonia produced by the catabolism of amino acids. It is transported by the blood to the kidneys from where it is excreted. Increased levels are found in renal diseases, urinary obstructions, shock, congestive heart failure and burns. Decreased levels are found in liver failure and pregnancy. To find whether this waste product is present in our blood or not, we do many tests. One of the most common and successful tests is DAM method. 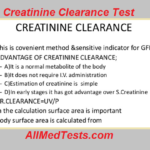 This test is easy to perform, its principle is quite a simple, reagents are easy to prepare, and these are the things which make it one of the best tests to find blood urea. We will now begin with the principle and reagents of finding blood urea by DAM Method. First, we will talk about the principle of this test to find blood urea. DAM stands for Diacetyl monoxime. 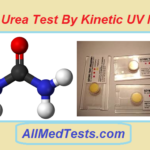 Urea in an acidic medium condenses with Diacetyl Monoxime at 100°C to form a red colored complex. Intensity of the color formed is directly proportional to the amount of urea present in the sample. If the above explanation wasn’t clear then you can understand it this way. First, the enzymatical conversion of urea take place into the elements such as Ammonia and Carbon Di-Oxide. Ammonia then gets converted into blue colored compound which is named carboxy endo phenol. Now this is where you detect urea from the intensity of the color of this compound. If the intensity of the color is more that means more urea is present in the blood. More the formation of this compound in the blood, this indicates more urea in blood. Let us now talk about the reagent the of this test. In every biological test, we need a reagent and so do in this one. In most of the DAM tests, the reagent is taken which is already prepared. 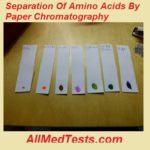 The reagent for this test is made by the alkaline solution of hypochlorite and phenol. The reason for making this solution in the conversion of Ammonia into that blue colored compound which I have already mentioned in the principle. Spectrophotometer and photo colorimeter are the devices which can be used to check the intensity of blue colored compound. The intensity of this compound indicates the intensity or presence of urea in the human blood. Once we have understood the principle and also prepared the reagent for the test, we are good to go with the test procedure. 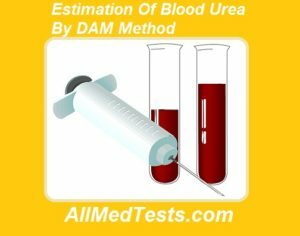 Let us now move to the DAM method of finding urea in human blood. Here is a step by step procedure of finding the Blood Urea. This is a very simple test and by following each step, you will be done within a matter of seconds. Make sure that each and every step is followed carefully. Let’s move now. Test tubes are necessary for this test. Take 3 of them and now you will need to label them. Since you are following us, you could name them to blank, unknown, and standard. Now follow this pattern of adding the serum in these tubes. 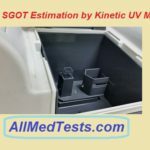 In the unknown tube, add 0.1 of serum. Now in the next tube which is a standard tube, add 0.1 ml of standard solution. In the last tube which is named blank, add 0.1 ml of distilled water. Now add 0.1 ml of the reagent R1 and R2 in all the test tubes respectively and leave them for 10 minutes at the room temperature. Now photo colorimeter can be used to detect the absorbance at 578 nm. The concentration of unknown tube can also be found using Beer-Lambert Law which you may have studied. Precautions are really very necessary before playing with all these chemicals and performing these tests. Let us now tell you the important precautions which you must take to make your test a successful one. 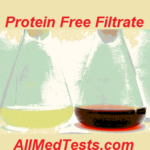 You can also use PFF (Protein-Free Filtrate) in the DAM Method which you might read before on our site. Make sure that you measure the amount of all the solutions correctly. Since you get to name the test tubes, write on them by attaching pieces of paper with them in order not to get confused. At the end, you will need to determine results which I have already mentioned. The intensity of the blue colored compound represents the presence of urea in the blood. If these are more urea, the color will be more intense. Make sure that all the steps were followed carefully during this test. By commenting in the feedback section below, you can give us your feedback and also leave your questions. 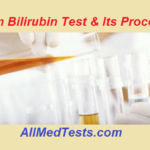 If you want more of these easy guides to perform biological tests, keep visiting All Med Tests.